For other people named Alex Smith, see Alex Smith (disambiguation). Alexander Douglas Smith (born May 7, 1984) is an American football quarterback for the Washington Redskins of the National Football League (NFL). He played college football for the Utah Utes, where he was named the Mountain West Conference Player of the Year in 2004 and led Utah to a victory at the 2005 Fiesta Bowl, finishing in the national top-five. Following the 2012 season, Smith was traded to the Kansas City Chiefs. In his first season with the team, he led them to a 9–0 start and their first playoff berth in three years. Smith went on to guide the Chiefs to an eleven-game winning streak in 2015 and their first playoff win since 1994. During his time with the Chiefs, only Tom Brady and Russell Wilson had won more games as a starting quarterback. He has been named to three Pro Bowls with the Chiefs, and led the league in passer rating in 2017. Following the 2017 season, Smith was traded to the Redskins and subsequently signed a four-year contract with them. Smith suffered a fractured leg in a game that season, which was reported to be potentially career threatening. Born in Bremerton, Washington, Smith grew up in La Mesa, California. His father, Douglas D. Smith, was an executive director at Helix High School, which Alex attended. As a starter for the Helix Scotties during his junior and senior years, Smith led his team to a record of 25–1, including two San Diego CIF section championships. He was named to the first-team all-conference and all-county squads in the San Diego CIF system. Smith also earned the conference offensive player of the year twice, and twice won the team MVP for Helix. During his time at Helix, Smith set a school record by throwing for six touchdowns in one game, and recorded the second-highest completion percentage in San Diego CIF history. While at Helix, he played with 2005 Heisman Trophy-winner (since vacated) Reggie Bush. Smith and Bush were later finalists for the 2004 Heisman, making it the first time a high school had two finalists at the same ceremony. Smith was president of his senior class in high school, and earned college credits through a program with San Diego State University and having taken a dozen Advanced Placement tests. Smith attended the University of Utah and played for the Utah Utes, wearing number 11. He finished fourth in voting for the 2004 Heisman Trophy and was selected as the 2004 Mountain West Conference Player of the Year. Smith posted a 21–1 record as a starter in college, while leading a high-powered spread offense under head coach Urban Meyer. He led the Utes to victories in the 2003 Liberty Bowl and the 2005 Fiesta Bowl. Smith earned a bachelor's degree in economics in two years with a 3.74 GPA, having matriculated with 64 credit hours earned before attending college, and began work on a master's degree before being drafted. At the NFL combine, Smith recorded a 4.7 time in the 40-yard dash, and had a 32-inch vertical leap. He also earned a score of 40 out of 50 on the Wonderlic exam. The San Francisco 49ers, who held the first overall pick, had hired a head coach with a strong personality in Mike Nolan. Nolan thought Smith to be cerebral, introspective, and non-confrontational. Nolan also evaluated Aaron Rodgers but did not believe that Rodgers's attitude could co-exist with him. Smith was the first overall pick in the 2005 NFL Draft, selected by the San Francisco 49ers. In July 2005, Smith agreed to a six-year, $49.5 million contract with the 49ers; the contract included $24 million in guaranteed money. Dealing with an injury and being taken in and out of the lineup by then-head coach Mike Nolan, Smith played in nine games in his rookie season, recording just one touchdown pass, against the Houston Texans, while throwing 11 interceptions. After the challenges faced by his rookie campaign, Smith went into the 2006 season with a new offensive coordinator (Norv Turner) and an improved set of offensive weapons around him. The 49ers used their top draft choice on tight end Vernon Davis. They also upgraded their offensive backfield, trading underachieving running back Kevan Barlow to the Jets, making Frank Gore the feature back. Smith also spent the off-season working daily with his new coordinator, wide receivers and tight end, while working to improve his technique and add bulk. The improved offensive cast clearly helped Smith develop in his second year, especially early. Smith's first three games of the season saw him throw three touchdowns, no interceptions, and amass 814 yards. After struggling in Kansas City, he then threw for three touchdowns against the Oakland Raiders, setting a career-high. However, the next five games saw Smith resume his growing pains, averaging only 153 yards per game while throwing only six touchdowns and nine interceptions. Despite his difficulty, he led the 49ers on a three-game winning streak in November. Smith met Joe Montana for the first time on November 5, 2006, during a game against the Vikings. The 49ers wore the throwback jerseys of the 1989 team which Joe Montana and teammates wore. The 49ers went on to win 9–3, upsetting the Minnesota Vikings. In need of a statement game, the 49ers traveled to Seattle for a Thursday Night Football game against their division rivals. During the broadcast on NFL Network, Cris Collinsworth noted that if he were starting an NFL franchise, he would have taken the Broncos rookie quarterback Jay Cutler before Alex Smith and fellow rookies Matt Leinart and Vince Young – and that Smith was not even close to the others. Going into the 4th quarter, the 49ers were trailing the Seahawks 7–3, and pulling out a win looked unlikely. Smith however performed brilliantly in the fourth quarter, and drove the 49ers on a long touchdown drive down the field early, taking a narrow 10–7 lead. Late in the quarter, with the same score, Smith struck again – shaking off an almost certain sack, rolling to the left and completing a pass to Frank Gore for a touchdown to give the 49ers a 10-point lead. On the next drive, Smith cemented the victory by leading yet another touchdown drive, and rushing for a touchdown on a naked bootleg. Collinsworth had earlier in the game observed that "Alex Smith is the best I've ever seen him. That drive is the best I saw," and on seeing his touchdown run, commented "What a second-half he has had!" After losing to the Cardinals the following week, the 49ers final game of the 2006 season was against a Denver Broncos team looking for a playoff berth. In a major upset, the 49ers defeated the Broncos and knocked them out of the playoffs. During the game at INVESCO Field, Smith threw for 194 yards and a touchdown, leading the team to a come from behind victory for the second time in three weeks. Overall, Smith improved in his second year by throwing as many touchdowns as interceptions. He threw for 16 touchdowns, 16 interceptions, 2,890 yards, and a 74.8 quarterback rating, all improvements over his rookie year. He became the first 49ers quarterback in club history to take every snap from center over the course of a season in 2006. Smith entered the 2007 season learning under a third offensive coordinator in three seasons. Norv Turner was hired as the head coach by the San Diego Chargers. Jim Hostler replaced Turner. Hostler's system involved a mixture of the offensive system installed by Turner with elements of the West Coast offense installed by Mike McCarthy for the 2005 season. During the off-season, the 49ers added wide receivers Darrell Jackson, Ashley Lelie, and rookie Jason Hill as new offensive targets for Smith. In the season opener on Monday Night Football against the Arizona Cardinals, Smith led the 49ers to a 20–17 win in a two-minute comeback. While down 17–13 with less than two-minutes left, Smith drove down the field, highlighted by a 25-yard scramble. After the scramble, he threw a 22-yard pass to Arnaz Battle that was fumbled on the one-yard line, but recovered by a 49er so the ball was placed back on the one-yard line with 26 seconds left. The following play Battle ran an end around for the game-winning touchdown. Smith finished the game 15 for 31 with 126 yards and two rushes for 37 yards. On September 30 in the first quarter of a game against the Seattle Seahawks, Smith injured his right shoulder after getting sacked by Seahawks defensive tackle Rocky Bernard. Smith suffered a grade-three separation and the initial diagnosis was that surgery would not be required. Smith missed the next three games before returning to the 49ers' starting lineup on Sunday, October 28, 2007. The 49ers did not win another game until November 25. Among all NFL quarterbacks who qualify for league statistics, only the Jets' Kellen Clemens had a poorer passer rating than Smith (57.2), Smith completed under 50% of his passes, far below the league average of 60%. Smith was at odds with 49ers head coach Mike Nolan over the severity of his injury. Nolan publicly implied that Smith was not fighting through the injury, while Smith felt that the injury still affected his ability to throw accurately, an account that was supported by players from the Seahawks. Nolan decided to rest Smith following a loss in that game to the Seahawks on November 12 and start Trent Dilfer to allow Smith's shoulder to recover. Following the decision, orthopedic surgeon James Andrews said that upon further examination the shoulder did not heal as significantly as Andrews thought it would, and on December 11, 2007, Smith was placed on injured reserve to undergo surgery on the shoulder, ending his season. Smith entered training camp competing for the starting quarterback job with Shaun Hill, who won both of the games he started in 2007, before suffering a back injury against the Tampa Bay Buccaneers, and journeyman J. T. O'Sullivan. Smith would be learning under a fourth different offensive coordinator in four seasons; Jim Hostler was fired and replaced by former Detroit Lions offensive coordinator and St. Louis Rams offensive coordinator/head coach Mike Martz. Unlike the previous three seasons, where offensive continuity was somewhat maintained, Martz's system was completely different. Smith lost the starting job in training camp to O'Sullivan, who was elevated to starting quarterback, partly due to his familiarity with Martz's offense when he was a member of the Detroit Lions. On September 10, the 49ers placed Smith on injured reserve after Dr. James Andrews confirmed the team's diagnosis of a broken bone in his shoulder, believed to have been caused by a wire left in his shoulder from the previous surgery, which had sawed through the bone. Regardless, the 49ers' general manager, Scot McCloughan, said that the 49ers expected to release Smith before the 2009 season, when they would owe him a salary of $9,625,000. After Nolan was fired on October 20, 2008, the 49ers expressed interest in having Smith remain for the 2009 season if he was willing to renegotiate his contract. On March 10, 2009, the 49ers announced that his contract had been successfully restructured and that he would stay with the team. He took a considerable pay cut to remain with the 49ers, with whom he would be under contract for the next two years. Smith was to make $4 million a season in 2009 and 2010, in addition to base salaries that were not immediately made known. In his previous contract, he was scheduled to make $24.6 million in the final two years. After the pay cut, Smith said that he was ready to compete for the starting quarterback spot, primarily against Shaun Hill. Mike Singletary became the head coach after a successful term as the interim head coach in 2008, and Martz was fired as offensive coordinator due to the huge differences in offensive philosophies between himself and Singletary. Jimmy Raye II was hired to replace him, marking Smith's fifth different offensive coordinator in five seasons. During the off-season, the 49ers drafted Michael Crabtree to be the featured receiver that Smith had been lacking throughout his NFL career. 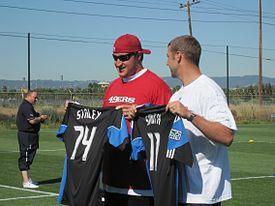 After restructuring his contract with San Francisco, Smith lost the battle for the starting quarterback position to Shaun Hill. However, in a Week 7 game against the Houston Texans, Smith replaced Hill in the third quarter, after Hill had performed poorly and the Niners faced a 21–0 first half deficit. Smith led the team back with three touchdown passes, all to tight end Vernon Davis, but fell short of victory, 24–21. Singletary named Smith as the 49ers' starting quarterback the next day at his weekly press conference on October 26. After his return as the 49ers' starting quarterback, Smith displayed signs of progress, despite the team's 3–4 record in his first seven starts. He led the 49ers to a Week 12 victory, 20–3, against the visiting Jacksonville Jaguars, throwing for 232 yards with two touchdown passes while posting a 96.8 passer rating. In a Week 13 match-up against the NFC West division rival Seattle Seahawks, he recorded the first 300-yard passing game of his career, completing 27 of 45 throws with two touchdown passes. Overall, he finished the season with 2,350 passing yards, 18 touchdowns, and 12 interceptions as the 49ers finished with an 8–8 record. Smith entered the 2010 season as the starting quarterback. For the first time in his career, he returned under the same offensive coordinator from the previous season, as Raye was retained. However, continuity in a poor system resulted in the team starting 0–5, and on September 27, Raye was fired and replaced by quarterbacks coach Mike Johnson. Under Johnson, Smith was expected to run a variation of the spread offense that he ran in college. The 49ers continued to build their team having now drafted Anthony Davis and Mike Iupati with their two first round picks to provide more protection. On September 8, Coach Singletary announced that Smith was named one of the team's captains. In Week 5, Smith was booed at home and the crowd chanted for his backup, David Carr, before leading the 49ers to two scoring drives to close within three points. However, he was hit as he threw on the third drive attempt, resulting in an interception and a 24–27 loss, dropping the 49ers to 0–5. Smith once again suffered an injured shoulder in the 49ers week 7 game against the Carolina Panthers and was not available to play Week 8 against the Denver Broncos in London. He was replaced by Troy Smith, who had 14 games of experience in the NFL before joining the 49ers organization just before the start of the regular season. Troy Smith took Smith's position after winning two straight games against the St. Louis Rams and the Denver Broncos. However, following a loss to the Green Bay Packers in Week 13 that left the 49ers with a 4–8 record, Troy Smith was demoted to backup in favor of Alex Smith. Smith would start against the Seattle Seahawks in Week 14 in a game the 49ers needed to win to stay in contention in the NFC West. Smith acknowledged that his performances needed to be more consistent. On December 12, 2010, the 49ers played the Seahawks in San Francisco. Smith was booed by the Candlestick crowd after the first two plays. However, the boos turned to cheers after Smith helped lead the 49ers to a 40–21 victory over a division rival. The win moved the 49ers one game behind the division leaders (Rams and Seahawks) with three games left to play. However, the 49ers struggled the following Thursday night against the San Diego Chargers and Troy Smith started the following game against the Rams. Troy Smith struggled in the loss to the Rams and Alex relieved Troy Smith in that game. After the game, Singletary was fired and Alex finished the season starting against the Cardinals. The 49ers finished the season 6–10 and Smith became a free agent after the season. After his firing, Singletary said, "You gotta have a quarterback." Smith had won just 19 games in 50 career starts through 2010. In 2010, he was chosen as the 11th-smartest athlete in sports by Sporting News. The 49ers hired Jim Harbaugh as the new head coach, and Greg Roman replaced Johnson as the new offensive coordinator. Harbaugh, a former quarterback, was the best teacher the 49ers had since Norv Turner in Smith's second season. Harbaugh made it known to Smith that he was welcomed back on the team. Smith's family wanted him to leave San Francisco. Although he was unsigned, Smith organized the players' workouts during the 2011 NFL lockout and helped to install Harbaugh's new offense. After the lockout ended, Smith signed a one-year $5 million contract with the 49ers. Smith was named the starting quarterback heading into the regular season, and Harbaugh believed Smith could succeed in the coach's West Coast offense. During the season, Smith's game showed marked improvement, especially in his leadership and intangibles. While he did not put up big numbers, he helped the 49ers win games through efficient play, minimizing mistakes and controlling the clock. In a road game against the Philadelphia Eagles in Week 4, Smith rallied the team from a 23–3 second-half deficit to win 24–23, completing 9 of 9 passes for 179 yards and two touchdowns in the third quarter alone. Two weeks later, Smith led his third come-from-behind road victory of the year with a six-yard fourth and goal touchdown pass to tight end Delanie Walker, beating the Lions in Detroit 25–19. In a week 10 matchup against the New York Giants, he completed 19 out of 30 passes for 242 yards. The Giants shut down the 49ers' run game (Frank Gore was held to zero yards on six carries before leaving the game in the second half) and Smith was instrumental in the 27–20 victory. By the time the 2011 season was finished, Smith had helped lead the 49ers to a 13–3 record in the regular season, including five come-from-behind victories in which four were on the road, and the 49ers earned a first-round bye in the playoffs. After 3 head coaches, 7 offensive coordinators, and 17 different starting wide receivers in the span of 7 seasons with the 49ers, Smith would finally make his first playoff appearance. While the 49ers finished with their most wins since 1997, they did it while ranked 29th of 32 teams in the NFL in total passing yardage for 2011 (including yardage lost from sacks), and Smith was often cynically referred to as a game manager. In this manner, The New York Times wrote that Smith was "a steady, if unspectacular, player surrounded by a solid team" in 2011, whose career year "underscored how much he struggled previously." It was his first season with over 3,000 yards passing, and he set personal single-season highs in virtually every relevant statistical category commonly cited for quarterbacks: in pass attempts with 445, in completions with 273, in completion percentage with 61.3 percent, in passing yards with 3,144, in average per pass with 7.1 yards per attempt, in overall passer rating with 90.7, in rushing attempts with 52, in rushing yards with 179, and in total touchdowns scored with 19 (17 passing & 2 rushing), all while being sacked a league-high 44 times. He also threw a league-low 5 interceptions in 2011, breaking a 49ers franchise record, and setting yet another personal single-season best in fewest passes intercepted per attempt with a 1.123 percent interception rate, likewise the lowest percentage in the league that year. In the NFC Divisional round of the playoffs, Smith led the 49ers to a win over the New Orleans Saints, with a final score of 36–32. Smith threw for 299 yards, three touchdown passes, and no interceptions while rushing for an additional touchdown. Smith led touchdown drives of 80 and 85 yards in the final 4:02. He scored on a 28-yard touchdown run, and he threw a game-winning 14-yard touchdown pass to Vernon Davis with nine seconds remaining, eschewing a more conservative open receiver that would have settled for a field goal and a tie. Analyst Ron Jaworski said "Alex Smith won the game, not Alex Smith by not making mistakes. His performance won the game for them." Smith also became the first quarterback in NFL playoff history to lead two go-ahead touchdowns in the final 3 minutes of a game. The 49ers lost 20–17 in overtime to the New York Giants in the NFC Championship Game. Smith completed 12 of 26 passes for 196 yards and two touchdowns, but the team turned the ball over twice on special teams. Smith was chosen by teammates as winner of the Ed Block Courage Award, annually awarded to the player that exemplifies a commitment to sportsmanship and courage. Smith made the USA Today All-Joe Team, an award which is given to the best players not to make the Pro Bowl. Smith became a free agent following the 2011 season. The 49ers were reported to be interested in signing Peyton Manning, who had just been released by the rebuilding Indianapolis Colts, leading Smith to visit the Miami Dolphins, reportedly with the intent to sign with the Dolphins if the 49ers signed Manning. Shortly after Manning made the decision to join the Denver Broncos, Smith signed a three-year contract worth $24 million to remain with the 49ers. During the off-season, the 49ers added wide receivers Randy Moss and Mario Manningham in free agency, and A. J. Jenkins in the first round of the 2012 NFL Draft to improve a passing game that lacked production from the receivers the previous season. Smith began the 2012 season as the 49ers' starting quarterback. Smith completed 18-of-19 passes for 232 yards and three touchdowns without an interception in a 24–3 Monday night win over Arizona, and San Francisco was 6–2 after eight games. In the following game against the St. Louis Rams, Smith suffered a concussion in the second quarter, throwing a touchdown with blurred vision before exiting the game. He was replaced by Colin Kaepernick, and the game ended in a 24–24 tie. Smith missed the following game, and Kaepernick was 16 for 23 for 243 yards with two touchdowns in a 32–7 win over the Chicago Bears. Harbaugh was impressed with Kaepernick, and said "we have two quarterbacks that have a hot hand" while dismissing any rule that a player should not lose their starting job due to an injury. A quarterback controversy began. Smith was ranked third in the NFL in passer rating (104.1), led the league in completion percentage (70%), and had been 19–5–1 as a starter under Harbaugh, while Kaepernick was considered more dynamic with his scrambling ability and arm strength. Smith was medically cleared to play the day before the following game, but Harbaugh chose not to rush him back and again started Kaepernick, who threw and ran for a touchdown in a 31–21 win over the New Orleans. The following week, Harbaugh announced that Kaepernick would start for the 8–2–1 49ers, while also stating that the assignment was week-to-week and not necessarily permanent. However, Kaepernick remained the starter as the 49ers again qualified for the playoffs. Harbaugh has stated that Smith had been more of a coach to Kaepernick later into the 2012 season than even he was. Before losing the starting quarterback job, Smith was on pace to set career highs in completion percentage, passing yards, yards-per-attempt, passing touchdowns and rushing yards. Smith was named to the USA Today All Joe Team for the second year in a row, and was also named the captain of the team. On February 27, 2013, the 49ers agreed to trade Smith to the Kansas City Chiefs for the Chiefs' second round pick in the 2013 NFL Draft and a conditional pick in the 2014 NFL Draft. The deal became official at the beginning of the new league year on March 12. After the trade became official, Chiefs head coach Andy Reid stated that Smith would be the starting quarterback for the 2013 season. Smith's job as the starter was solidified during OTA's (Organized Team Activities, a term usually referring to NFL pre-season activities). According to coaches and teammates, Smith displayed a very high "football IQ," and his accuracy in passing was lauded as the best many had ever seen. According to Kansas City's quarterbacks coach, Smith was "super intelligent" and had all of the intangibles that he looked for in a quarterback. The Chiefs were the last unbeaten team in the 2013 NFL season with Smith winning his first nine regular season starts, gaining 1,919 passing yards with nine touchdowns compared to four interceptions. Smith earned his first and only perfect passer rating on December 15, 2013. He was 17 of 20, with 287 yards and 5 touchdowns, four of them going to Jamaal Charles, in a victory over the Oakland Raiders. Alex Smith and the Chiefs lost to Andrew Luck and the Indianapolis Colts in the AFC Wild-Card Playoff Game on January 4, 2014. Smith threw four touchdowns, completing 30 of his 46 pass attempts for 378 yards and no interceptions, while also carrying the ball 8 times for 57 yards. However, he did commit his team's only turnover, losing a fumble. The final score of the game was 45–44 in favor of the Colts. 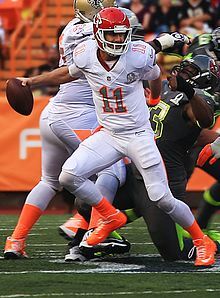 Smith was elected to his first Pro Bowl at the end of the season as a replacement for Tom Brady. In the game, Smith led all quarterbacks in yards, tied for most touchdowns, and led the game-winning touchdown drive at the end of the game for a 22–21 win. On August 31, 2014, Smith and the Chiefs agreed to a four-year contract extension. Smith appeared in 15 games and completed 65.3% of his passes in the 2014 season while throwing for 3,265 yards and 18 touchdowns to only six interceptions. However, the Chiefs finished with a 9-7 record and did not qualify for the playoffs. After another strong season in 2015, Smith was elected to the Pro Bowl as an alternate, but turned down the offer. He once again lead the Chiefs to the playoffs, where the Chiefs defeated the Houston Texans 30-0 in the Wild Card round. Smith threw for 190 yards, a touchdown, and one interception in the victory over the Texans. He also rushed 5 times for 27 yards, and had a 64-yard scramble, which was called back due to a holding penalty. The Chiefs went on to lose 27-20 against the New England Patriots in the divisional round. The Chiefs became the first team ever to start the season 1-5 and win a playoff game. At the end of the season, Sports Illustrated named him the best looking quarterback in the NFL, an honor previously won by Tom Brady. He was named team MVP for 2015 alongside safety Eric Berry. In the regular season Smith threw for 3,486 yards, 20 touchdowns, and only 7 interceptions, with a completion percentage of 65.3, passer rating of 95.4, and 7.4 yards per attempt. He also rushed 84 times for 498 yards, 2 touchdowns, and an average of 5.9 yards per carry. At the end of the season, he was recognized as the 81st best player by his peers on the NFL Top 100 Players of 2016. In Week 1, Smith led a fourth quarter comeback over the San Diego Chargers to win the game 33–27 in overtime after facing a 24–3 deficit with six minutes left in the third quarter. Smith won the game in overtime with a two-yard rushing touchdown. This became the largest comeback win in Chiefs history as the Chiefs started the 2016 season on a positive note. In 2016, Smith posted a career-high passing yards with 3,502 and a career-high 328 completions despite missing one game. In addition, he ran for a career-high five touchdowns, with three of them coming in the last three games. He was ranked 81st by his fellow players, for the second consecutive year, on the NFL Top 100 Players of 2017. During the season opener on Thursday Night Football on September 8, Smith finished with 368 passing yards and four touchdowns as the Chiefs pulled off a 42–27 victory over the defending Super Bowl champion New England Patriots. Smith's 368 passing yards and four passing touchdowns were both the second most in a game in his career. Smith's performance in Week 1 led all eligible passers in yards and earned him AFC Offensive Player of the Week, marking the first time that he won the award. During Week 13 against the New York Jets, Smith finished with 366 passing yards and 4 touchdowns. After the first 2 minutes and 46 seconds had passed in the first quarter, Smith quickly got 2 touchdown passes to Travis Kelce. However, the performance was overshadowed as defensive penalties and errors proved to be costly as the Chiefs lost 38-31. With his performance against the Jets, Smith became the first player in the modern era to have both a 70-yard pass and a 70-yard run in the same game. With a playoff spot already secured, Smith was given a rest in Week 17, and Chiefs' 2017 1st round pick Patrick Mahomes made his NFL debut against the Denver Broncos. Smith finished the 2017 regular season with 4,042 passing yards and 26 touchdowns, both career highs. He was named an alternate for the Pro Bowl, eventually replacing the injured Philip Rivers. Overall, in the 2017 season, Smith finished with 4,042 passing yards (8th in the NFL), 26 touchdowns, five interceptions, and a league-leading 104.7 passer rating. In the Wild Card Round against the Tennessee Titans, Smith had 264 passing yards and two touchdowns in the 22–21 defeat. On January 30, 2018, the Kansas City Chiefs agreed to trade Smith to the Washington Redskins in exchange for cornerback Kendall Fuller and a third-round pick (78th overall) in the 2018 NFL Draft. The trade became official on March 14, the first day of the new league year. He subsequently signed a four-year, $94 million contract extension with them. In his debut, he had 255 passing yards and two touchdowns in a win against the Arizona Cardinals. Through the first nine games of the season, he helped lead the Redskins to a 6–3 record. During a Week 11 game against the Houston Texans on November 18, 2018, Smith suffered a compound and spiral fracture to his tibia and fibula in his right leg when he was sacked by Kareem Jackson and J. J. Watt, ending his season. The injury drew parallels to former Redskins quarterback Joe Theismann, who also broke his leg in a game 33 years to the day in 1985. Smith remained hospitalized for nearly a month due to post-surgery complications, with him having multiple procedures to remove infected tissue. During the offseason, reports surfaced that the team believed he would not be able to heal in time to play for them during the 2019 season. Most wins by a quarterback through first three seasons. Smith has a brother, Josh, and two sisters, Abbey and MacKenzie. One of Smith's great-grandfathers was an Austrian immigrant of Serbian descent who immigrated to the U.S. from the Austro-Hungarian Empire when he was 12 years old. To honor him, Smith, his brother, and his father are each tattooed with four firesteels, the traditional Serbian cross. Smith's uncle, John L. Smith, is a college football head coach, and his cousin, Chris Shelton, is a former Major League Baseball player. In 2014, Alex was awarded an honorary degree by the University of Utah, where he also delivered the commencement speech for the graduating class. In 2007, Smith started The Alex Smith Foundation and the Alex Smith Guardian Scholars Program, which helps send foster teens to college. He started the program with $500,000, and continues to personally fund the majority of the charity with his own money. The Boston Globe held up Smith's foundation as a model charity that properly allocated its funding, noting that it raised over $800,000 between 2008 and 2010 and spent 91 percent of the funds on scholarships and grants. Smith married former Oakland Raiders cheerleader Elizabeth Barry in 2009. They have two sons together. ^ Ratto, Ray (April 24, 2005). "It's all or nothing for Smith, 49ers". San Francisco Chronicle. Archived from the original on February 2, 2014. Retrieved January 20, 2014. ^ "By the Numbers: Alex Smith". Chiefs.com. Archived from the original on January 17, 2018. ^ Mosher, Terry (January 20, 2012). "Doug Smith brought Olympic to rare heights". Kitsap Sun. Archived from the original on December 7, 2013. ^ "Helix High to keep its charter". Archived from the original on August 27, 2016. Retrieved April 30, 2010. ^ Klein, Gary. "2 teams have 4 candidates for Heisman". Chicago Tribune. Archived from the original on March 12, 2018. Retrieved March 11, 2018. ^ "Alex Smith answers call as top choice by San Francisco 49ers". Archived from the original on January 25, 2012. Retrieved September 7, 2007. ^ "Alex Smith College Stats". College Football at Sports-Reference.com. Archived from the original on March 11, 2018. Retrieved March 11, 2018. ^ "2004 Heisman Trophy Voting". College Football at Sports-Reference.com. Archived from the original on January 15, 2018. Retrieved January 15, 2018. ^ "Alex Smith 2003 Game Log". College Football at Sports-Reference.com. Archived from the original on March 12, 2018. Retrieved March 11, 2018. ^ "Alex Smith 2004 Game Log". College Football at Sports-Reference.com. Archived from the original on March 12, 2018. Retrieved March 11, 2018. ^ "Liberty Bowl - Utah vs Southern Mississippi Box Score, December 31, 2003". College Football at Sports-Reference.com. Archived from the original on January 15, 2018. Retrieved January 15, 2018. ^ "Fiesta Bowl - Utah vs Pittsburgh Box Score, January 1, 2005". College Football at Sports-Reference.com. Archived from the original on January 15, 2018. Retrieved January 15, 2018. ^ Lewis, Michael C. "Red alert: super-sharp Alex Smith, a Heisman candidate with smarts to match his skills, is leading Utah on a historic march" The Sporting News, November 22, 2004. ^ a b "Alex Smith Donates $500,000 To Utah Athletics". Official Website of Utah Athletics. Archived from the original on December 7, 2008. Retrieved July 21, 2010. ^ Sorensen, Mike. U. 's Smith is true student athlete Deseret Morning News, December 20, 2004. ^ "Alex Smith". nfldraftscout.com. Archived from the original on September 9, 2016. Retrieved September 9, 2016. ^ "Alex Smith 2005 NFL Combine Results". ESPN.com. Archived from the original on February 24, 2011. ^ "Alex Smith Wonderlic Score". Retrieved March 16, 2007. ^ Peterson, Gary (January 26, 2011), "Peterson: 49ers fans can play fantasy football over Aaron Rodgers vs. Alex Smith and Mike McCarthy vs. Mike Nolan", San Jose Mercury News, archived from the original on January 27, 2011, Nolan was no-nonsense, a strong personality who didn't like to be challenged. He met with Rodgers and Smith before the draft. He caught a whiff of attitude from Rodgers, and that was that. ^ "2005 NFL Draft Listing". Pro-Football-Reference.com. Archived from the original on September 21, 2017. Retrieved January 15, 2018. ^ "Houston Texans at San Francisco 49ers - January 1st, 2006". Pro-Football-Reference.com. Archived from the original on July 9, 2017. Retrieved January 15, 2018. ^ "Alex Smith 2005 Game Log". Pro-Football-Reference.com. Archived from the original on January 15, 2018. Retrieved January 15, 2018. ^ "Oakland Raiders at San Francisco 49ers - October 8th, 2006". Pro-Football-Reference.com. Archived from the original on March 13, 2018. Retrieved March 11, 2018. ^ "2006 San Francisco 49ers Statistics & Players". Pro-Football-Reference.com. Archived from the original on February 4, 2018. Retrieved March 11, 2018. ^ "Minnesota Vikings at San Francisco 49ers - November 5th, 2006". Pro-Football-Reference.com. Archived from the original on January 15, 2018. Retrieved January 15, 2018. ^ a b Matt Maiocco. "Matt Maiocco account of SEA vs. SFO game". Archived from the original on March 18, 2007. Retrieved March 16, 2007. ^ "San Francisco 49ers at Denver Broncos - December 31st, 2006". Pro-Football-Reference.com. Archived from the original on January 15, 2018. Retrieved January 15, 2018. ^ "Alex Smith 2006 Game Log". Pro-Football-Reference.com. Archived from the original on January 15, 2018. Retrieved January 15, 2018. ^ "Cardinals vs. 49ers - Box Score - September 10, 2007 - ESPN". ESPN.com. Archived from the original on September 17, 2007. ^ "2007 San Francisco 49ers Statistics & Players". Pro-Football-Reference.com. Archived from the original on March 13, 2018. Retrieved March 11, 2018. ^ a b c d Rosenthal, Gregg (January 22, 2012). "They Believed, Smith Delivered". NBC Universal. Archived from the original on January 23, 2012. ^ a b Lynch, Kevin (October 20, 2008). "Why Mike Nolan was Fired". sfgate.com. Hearst Communications. Archived from the original on January 20, 2012. ^ "Player notes". USA Today. Archived from the original on May 8, 2009. ^ "Alex Smith 2007 Game Log". Pro-Football-Reference.com. Archived from the original on January 15, 2018. Retrieved January 15, 2018. ^ a b "Niners QB Smith has broken shoulder, will not play this season". September 10, 2008. Archived from the original on September 12, 2008. Retrieved September 10, 2008. ^ "Alex Smith an unanswered question for 49ers". Archived from the original on April 2, 2009. Retrieved March 31, 2008. ^ "49ers place Smith on injured reserve with broken bone in shoulder". Archived from the original on September 11, 2008. ^ Crumpacker, John (August 17, 2010). "McCloughan talks up possible return by Smith". The San Francisco Chronicle. Archived from the original on July 29, 2009. ^ "QB Smith agrees to reduced pay to stay in San Francisco". Si.com. March 10, 2009. Archived from the original on March 13, 2009. Retrieved September 20, 2018. ^ "San Francisco 49ers, Alex Smith rework contract – ESPN". Sports.espn.go.com. March 11, 2009. Archived from the original on August 16, 2010. Retrieved August 4, 2011. ^ Killion, Ann (March 10, 2009). "A new beginning for Alex Smith with 49ers". Mercury News. Archived from the original on September 27, 2012. Retrieved March 11, 2009. ^ KRISTIE RIEKEN. "Texans hold on to beat 49ers 24–21". Sports.yahoo.com. Archived from the original on July 15, 2012. Retrieved August 4, 2011. 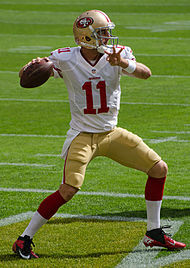 ^ "Jaworski sees improved mechanics for 49ers quarterback Alex Smith | 49ers Hot Read". mercurynews.com. December 10, 2009. Archived from the original on August 5, 2011. Retrieved August 4, 2011. ^ "Jacksonville Jaguars vs. San Francisco 49ers – Recap – November 29, 2009 – ESPN". ESPN.com. November 29, 2009. Archived from the original on June 6, 2011. Retrieved August 4, 2011. ^ "San Francisco 49ers vs. Seattle Seahawks – Recap – December 06, 2009 – ESPN". ESPN.com. December 6, 2009. Archived from the original on November 2, 2010. Retrieved August 4, 2011. ^ "Alex Smith 2009 Game Log". Pro-Football-Reference.com. Archived from the original on March 13, 2018. Retrieved March 11, 2018. ^ "2009 San Francisco 49ers Statistics & Players". Pro-Football-Reference.com. Archived from the original on July 8, 2017. Retrieved March 11, 2018. ^ "49ers QB Smith earns full-time captain duties". ESPN.com. September 9, 2010. Archived from the original on March 12, 2018. Retrieved March 11, 2018. ^ "Kevin Kolb, Eagles survive as more turnovers keep 49ers winless". ESPN.com. Associated Press. October 10, 2010. Archived from the original on January 20, 2012. ^ Borden, Sam (January 19, 2012). "As a 49er, Carr Saw Alex Smith's Confidence". The New York Times. p. B15. Archived from the original on January 20, 2012. ^ "Smith injures non-throwing shoulder in 49ers' loss to Panthers". Archived from the original on December 3, 2010. ^ "NFL.com Scores". www.nfl.com. Archived from the original on August 17, 2012. ^ "2010 San Francisco 49ers Statistics & Players". Pro-Football-Reference.com. Archived from the original on January 15, 2018. Retrieved January 15, 2018. ^ Brown, Daniel (December 8, 2010). "San Francisco 49ers' Alex Smith won't stop believing ... in himself". San Jose Mercury News. Archived from the original on February 10, 2011. ^ "Seattle Seahawks at San Francisco 49ers - December 12th, 2010". Pro-Football-Reference.com. Archived from the original on January 15, 2018. Retrieved January 15, 2018. ^ "2010 San Francisco 49ers Statistics & Players". Pro-Football-Reference.com. Archived from the original on January 15, 2018. Retrieved March 11, 2018. ^ "QBs rewriting history on Sunday". ESPN.com. January 21, 2012. Archived from the original on January 23, 2012. ^ a b Fox, Ashley (January 18, 2012). "Alex Smith has the 49ers in good hands". ESPN.com. Archived from the original on January 20, 2012. ^ a b c Brown, Daniel (January 21, 2012). "49ers' magic run had beginnings at Camp Alex". San Jose Mercury News. Archived from the original on January 22, 2012. ^ Killion, Ann (August 1, 2011). "New era begins for 49ers, but will San Francisco get any better?". SI.com. Archived from the original on August 4, 2011. ^ a b "Alex Smith named starter for 49ers". ESPN.com. Associated Press. September 2, 2011. Archived from the original on September 29, 2011. Retrieved September 2, 2011. ^ "San Francisco 49ers at Philadelphia Eagles - October 2nd, 2011". Pro-Football-Reference.com. Archived from the original on November 8, 2017. Retrieved January 15, 2018. ^ "San Francisco 49ers at Detroit Lions - October 16th, 2011". Pro-Football-Reference.com. Archived from the original on November 7, 2017. Retrieved January 15, 2018. ^ "New York Giants at San Francisco 49ers - November 13th, 2011". Pro-Football-Reference.com. Archived from the original on January 15, 2018. Retrieved January 15, 2018. ^ "2011 San Francisco 49ers Statistics & Players". Pro-Football-Reference.com. Archived from the original on August 4, 2017. Retrieved March 11, 2018. ^ "NFL Season Standings: Division - NFL.com". www.nfl.com. Archived from the original on June 7, 2015. ^ "National Football League Stats - by Team Category - NFL.com". www.nfl.com. Archived from the original on June 7, 2015. ^ a b Bishop, Greg (January 15, 2012). "Smith, for Once, Is a Reason for San Francisco's Victory". The New York Times. p. SP3. Archived from the original on January 17, 2012. ^ Sullivan, Tim (November 13, 2011). "Though not flashy, Smith now a 'game manager'". The San Diego Union-Tribune. Archived from the original on January 17, 2012. ^ a b c d e f g h i j k "Alex Smith". NFL.com. Archived from the original on September 11, 2012. ^ a b "National Football League Stats - by Player Category - NFL.com". www.nfl.com. Archived from the original on February 15, 2012. ^ Burke, Brian (January 19, 2012). "Title Game Probabilities: Giants Should Be Favored". The New York Times. Archived from the original on January 20, 2012. ^ Ortiz, Jorge L. (January 15, 2012). "TD could become 'The Catch III' in 49ers lore". USA Today. David Hunke; Gannett Company. Archived from the original on January 20, 2012. ^ Benoit, Andy (January 16, 2012). "Quick Hits: Alex Smith Trusts His Arm". The New York Times. Archived from the original on January 17, 2012. ^ "Giants stun 49ers with OT FG to set up Super rematch with Patriots". ESPN.com. Associated Press. Archived from the original on January 23, 2012. ^ Branch, Eric (January 25, 2012). "49ers long-snapper Brian Jennings in Pro Bowl". San Francisco Chronicle. p. B-7. Archived from the original on January 26, 2012. ^ "Texans' Mike Brisiel headlines USA TODAY's 20th All-Joe team". USA Today. January 27, 2012. ^ Branch, Eric (March 21, 2012). "Alex Smith, 49ers agree to 3 years, 24 million". The San Francisco Chronicle. Archived from the original on March 21, 2012. ^ a b Branch, John (January 11, 2013). "Teacher's Grade Hinges on Student's Playoff Test". The New York Times. Archived from the original on April 3, 2015. Retrieved January 14, 2013. ^ a b "Colin Kaepernick on first team". ESPN.com. November 21, 2012. Archived from the original on November 22, 2012. ^ "Harbaugh: 49ers will start 'hot hand'". ESPN.com. November 21, 2012. Archived from the original on November 22, 2012. ^ Bell, Jarrett (November 20, 2012). "Jim Harbaugh is playing with fire by inviting quarterback controversy". USA Today. Archived from the original on November 22, 2012. ^ Dodds, Eric (November 28, 2012). "Examining the 49ers Quarterback Controversy". time.com. Archived from the original on November 28, 2012. ^ Sando, Mike (November 27, 2012). "Reaching back for 49ers QB parallels". ESPN.com. Archived from the original on November 28, 2012. ^ Sando, Mike (November 26, 2012). "Victory trumps QB confusion for 49ers". ESPN.com. Archived from the original on November 26, 2012. ^ Klemko, Robert (November 26, 2012). "Kaepernick doesn't disappoint as 49ers defeat Saints". USA Today. Archived from the original on November 26, 2012. ^ "Colin Kaepernick to start for 49ers". ESPN.com. November 28, 2012. Archived from the original on November 28, 2012. ^ Jim Harbaugh: Alex Smith coaches Colin Kaepernick more than I do – ProFootballTalk.com Archived January 31, 2013, at the Wayback Machine, January 28, 2013. ^ Wachtel, Kyle. "Alex Smith heads to Kansas City". ForensicFantasy.com. Archived from the original on May 7, 2013. Retrieved April 15, 2013. ^ Davis, Nate (February 13, 2013). "Alex Smith, Super Bowl QBs headline USA TODAY Sports' 21st All-Joe team". USA Today. Archived from the original on May 9, 2013. ^ "49ers Acquire Picks in Alex Smith Trade". 49ers.com. March 12, 2013. Archived from the original on March 16, 2013. Retrieved March 31, 2013. ^ Gantt, Darin (March 12, 2013). "Alex Smith-to-Chiefs trade now official - ProFootballTalk.com". Archived from the original on March 14, 2013. ^ "Chiefs Q & A: Quarterbacks Coach Matt Nagy". kcchiefs.com. June 19, 2013. Archived from the original on August 2, 2013. Retrieved August 24, 2013. ^ "Alex Smith 11; Quarterback; Kansas City Chiefs (Player profile)". Archived from the original on October 10, 2013. Retrieved October 28, 2013. ^ "Kansas City Chiefs at Oakland Raiders - December 15th, 2013". Pro-Football-Reference.com. Archived from the original on January 15, 2018. Retrieved January 15, 2018. ^ "Wild Card - Kansas City Chiefs at Indianapolis Colts - January 4th, 2014 - Pro-Football-Reference.com". Pro-Football-Reference.com. Archived from the original on September 4, 2017. ^ Alper, Josh (January 21, 2014). "Alex Smith in, Tom Brady out for Pro Bowl". Archived from the original on January 22, 2014. ^ "Chiefs reach new four-year deal with quarterback Alex Smith". The Kansas City Star. August 31, 2014. Archived from the original on September 1, 2014. Retrieved August 31, 2014. ^ "Alex Smith 2014 Game Log". Pro-Football-Reference.com. Archived from the original on November 15, 2017. Retrieved November 14, 2017. ^ "2014 Kansas City Chiefs Statistics & Players". Pro-Football-Reference.com. Archived from the original on November 15, 2017. Retrieved November 14, 2017. ^ "Wild Card - Kansas City Chiefs at Houston Texans - January 9th, 2016". Pro-Football-Reference.com. Archived from the original on November 16, 2017. Retrieved November 15, 2017. ^ "Divisional Round - Kansas City Chiefs at New England Patriots - January 16th, 2016". Pro-Football-Reference.com. Archived from the original on December 26, 2017. Retrieved January 15, 2018. ^ Sommers, Jon Wertheim and Sam. "What's behind attractiveness in NFL quarterbacks?". Archived from the original on July 10, 2017. ^ "Alex Smith 2015 Game Log". Pro-Football-Reference.com. Archived from the original on January 15, 2018. Retrieved January 15, 2018. ^ "'Top 100 Players of 2016': No. 81 Alex Smith". NFL.com. Archived from the original on May 12, 2016. ^ "Kansas City Chiefs Biggest Comebacks". Pro-Football-Reference.com. Archived from the original on September 9, 2017. Retrieved September 8, 2017. ^ "Alex Smith 2016 Game Log". Pro-Football-Reference.com. Archived from the original on January 15, 2018. Retrieved January 15, 2018. ^ "Alex Smith 2016 Game Log". Pro-Football-Reference.com. Archived from the original on September 8, 2017. Retrieved September 8, 2017. ^ "'Top 100 Players of 2017': No. 81 Alex Smith". NFL.com. Archived from the original on August 28, 2017. ^ Rosenthal, Gregg. "Takeaways: Alex Smith, Kareem Hunt pace Chiefs' win". NFL. Archived from the original on September 8, 2017. Retrieved September 8, 2017. ^ "Kansas City Chiefs at New England Patriots - September 7th, 2017". Pro-Football-Reference.com. Archived from the original on September 8, 2017. Retrieved September 8, 2017. ^ "Alex Smith Career Game Log". Pro-Football-Reference.com. Archived from the original on September 9, 2017. Retrieved September 8, 2017. ^ Lam, Quang M. (September 13, 2017). "Alex Smith, Sam Bradford among Players of the Week". NFL.com. Archived from the original on September 13, 2017. ^ "Kansas City Chiefs at New York Jets - December 3rd, 2017". Pro-Football-Reference.com. Archived from the original on January 15, 2018. Retrieved January 15, 2018. ^ Jones, Lindsay H. (December 31, 2017). "Kansas City Chiefs QB of future Patrick Mahomes stars against Paxton Lynch, Denver Broncos". usatoday.com. Archived from the original on January 3, 2018. Retrieved January 2, 2018. ^ Alper, Josh (January 12, 2018). "Alex Smith added to AFC Pro Bowl roster". ProFootballTalk.com. Archived from the original on January 23, 2018. Retrieved September 20, 2018. ^ "Alex Smith 2017 Game Log". Pro-Football-Reference.com. Archived from the original on January 15, 2018. Retrieved January 15, 2018. ^ "Wild Card - Tennessee Titans at Kansas City Chiefs - January 6th, 2018". Pro-Football-Reference.com. Archived from the original on January 10, 2018. Retrieved January 15, 2018. ^ Paylor, Terez A. (January 30, 2018). "Chiefs trade Alex Smith to Washington, saving $15.6 million". The Kansas City Star. Archived from the original on January 31, 2018. Retrieved January 31, 2018. ^ Czarda, Stephen. "Redskins Trade For Pro Bowl Quarterback Alex Smith". Redskins.com. Archived from the original on March 14, 2018. Retrieved March 14, 2018. ^ Axson, Scooby. "Report: Redskins QB Alex Smith Signs Extension; To Make $40 Million in 2018". SI.com. Retrieved September 7, 2018. ^ "New Redskins QB Alex Smith leads Washington to victory over Arizona". WTTG. Retrieved October 2, 2018. ^ "Alex Smith 2018 Game Log". Pro-Football-Reference.com. Retrieved January 23, 2019. ^ Sessler, Marc. "Redskins QB Alex Smith suffers broken tibia, fibula". NFL.com. Retrieved November 18, 2018. ^ Williams, Charean. "Alex Smith's compound fracture will require 6–8 month recovery". Pro Football Talk. Retrieved November 20, 2018. ^ Stubbs, Roma. "Exactly 33 years since his own gruesome injury, Joe Theismann 'just so upset' for Alex Smith". Washington Post. Retrieved November 19, 2018. ^ Gordon, Grant. "Redskins' Alex Smith out of hospital, back at home". NFL.com. Retrieved December 16, 2018. ^ Teope, Herbie. "Alex Smith battling leg infection after surgery". NFL.com. Retrieved December 6, 2018. ^ "Redskins believe Alex Smith (leg) will miss all of 2019". NFL. Retrieved January 27, 2019. ^ "Chiefs vs. Raiders - Box Score - December 15, 2013 - ESPN". Scores.espn.go.com. December 15, 2013. Retrieved March 20, 2017. ^ Larrabee, Kirk. "Alex Smith broke NFL accuracy record, just before his INT". 247Sports. Retrieved August 18, 2018. ^ a b c "San Francisco 49ers Passing Single-season Register". pro-football-reference.com. Archived from the original on September 28, 2012. Retrieved September 11, 2012. ^ "Alex Smith Discusses His Non-Interception Record". Archived from the original on September 15, 2012. ^ Florio, Mike (September 23, 2012). "Alex Smith's 249-throw streak without an interception ends with a thud". Archived from the original on September 26, 2012. ^ "Highest Passer Rating, Chiefs career". pro-football-reference.com. Retrieved January 3, 2017. ^ "Highest Completion Percentage, Chiefs career". pro-football-reference.com. Retrieved January 3, 2017. ^ "Highest Completion Percentage, Chiefs season". pro-football-reference.com. Retrieved January 3, 2017. ^ "Lowest Percentage, Passes Had Intercepted, Chiefs career". pro-football-reference.com. Retrieved January 3, 2017. ^ "Alex Smith Has Turned Boos Into Cheers As 49ers QB". sacramento.cbslocal.com. January 11, 2012. Archived from the original on January 15, 2012. ^ "Arkansas to hire coach with 49ers ties (but it isn't Greg Roman)". 49ers Blog. April 23, 2012. Archived from the original on April 25, 2012. ^ "The 5 Things You Might Not Have Known About John L. Smith". Arkansas Sports 360. April 24, 2012. Archived from the original on April 27, 2012. ^ "Commencement 2014". The University of Utah. May 1, 2014. Archived from the original on May 6, 2014. Retrieved September 20, 2018. ^ a b Branch, Eric. "Alex Smith gave his all – off the field, too". sfgate.com. San Francisco Chronicle. Archived from the original on March 15, 2013. Retrieved March 13, 2013. ^ Branch, Eric. "Alex Smith's foundation held up as a non-profit model". SFGate. San Francisco Chronicle. Archived from the original on March 13, 2013. Retrieved March 13, 2013. ^ Borchers, Callum. "In nonprofit game, many athletes post losing records". Boston Globe. Globe Newspaper Company. Archived from the original on March 2, 2013. Retrieved March 13, 2013. ^ a b Adams, Jonathan (January 9, 2016). "Elizabeth Smith, Alex's Wife: 5 Fast Facts You Need to Know". Heavy.com. Retrieved September 20, 2018. Wikimedia Commons has media related to Alex Smith.